9K White Gold AA Santa Maria Aquamarine (Ovl), Natural Cambodian Zircon Half Eternity Band Ring 1.000 Ct.
Super Auction- New York Close Out 14K Yellow Gold Diamond (Rnd) (I1-I2/G) Ring 0.500 Ct.
ILIANA 18K Y Gold IGI Certified Diamond (Bgt) (SI/G-H) Ring 0.500 Ct. Ancient Egyptians viewed a circle with no beginning and end as a symbol of eternity and the serving of a ring to a woman signified never-ending love between the couple. The wedding ring has therefore, been an indispensable part of matrimony since ancient times worn as a public pledge to honour the marriage contract. From braided rings of grass to iron rings to gold bands and diamond studded platinum rings, these rings have evolved like no other piece of jewellery has. Contrary to popular belief, the tradition of bridegrooms wearing a wedding ring is not as ancient but started only in the latter part of the last century. A physical representation of eternal love and wedding vows, it is the dearest possession of a lady and a modern man. 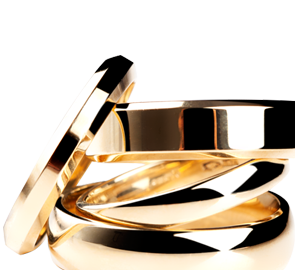 TJC has put together an exceptional collection of Gold and Diamond wedding bands and rings for the women in UK. The diversity in designs and price point of our rings ensures you have no dearth of options and choose a piece that defines your relationship the best. While planning a wedding, choosing the dress might seem like the most intimidating task but choosing the perfect ring is the most crucial of all, for it is a testimony of your marriage and stays with you forever. There are a million things to consider before making a selection: should it match the engagement ring, should it be strong, should it complement your look for the day, should it be in sync with your personality and so on. Under the in-house brands Iliana and Rhapsody, TJC has a rich collection of eternity rings, wedding band and ring sets, patterned and textured rings set in 9K, 14K and 18K, white, rose and yellow gold at incredible prices that make sturdy and timeless pieces to signify your love. A wedding ceremony might be the union of two lives and souls but we all know it is the bride who garners the maximum attention on the day. Every bride plans her big day perfectly to the letter, ensuring everything goes to plan. We, at TJC have been planning too, designing the best of diamond wedding rings, finishing them to the last detail so that we deliver to you an impeccable piece. Known to be the harbinger of love, strength and endurance, Diamond is the most appropriate and popular choice for a wedding ring which symbolizes the couple’s loyalty and commitment. TJC has an extensive array in solitaire, eternity, cluster and floral setting to suit your individual style. So, shine bright with TJC’s diamonds for it is your day after all. Traditional or not, we are sure most of you will be collecting your ‘something old, something new, something borrowed, something blue’ tokens for ‘The Day’. Do not fret about the ‘something blue’ – let that be TJC’s Tanzanite ring glistening on your finger. For the modern brides and free souls who do not wish to settle for the usual and don something different, we have an eclectic collection of gemstone wedding rings combining emeralds, rubies, sapphires with diamonds which will charm their way to your heart. It is the beauty in the history of a wedding ring that makes it so special and worthy of all fortunes and with every piece that we create, we aim to make your eyes sparkle not only with the excitement but also the sheen of our gemstones. From ‘Yes’ to ‘I Do’ to ‘Forever’, we have something to mark every special day of your life. Let TJC, with our engagement, wedding and eternity rings be a part of your beautiful journey.